This adorable little dress is probably from the 1970’s. It features little white anchors with sweet matching anchor buttons. 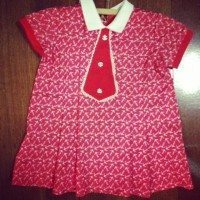 How adorable would this be on your tiny tot with white knee-hi’s & red patent shoes? Too cute for words!! It is in good condition & would fit a little girl up to 2 years.